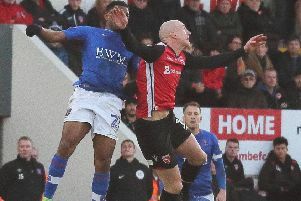 Morecambe face Luton Town tomorrow with manager Jim Bentley believing the hosts will be the team under pressure. The Shrimps, who sit 19th in League Two, travel to Kenilworth Road to face the table toppers on the back of seven points from their last nine. Their hosts go into the game on the back of two defeats in their last three games, having suffered a surprise loss against struggling Chesterfield last time out. The two sides have met at the Globe Arena already this season with a goalless draw the outcome in September. “There is no pressure on us for this one – it’s all on them,” Bentley said of tomorrow’s meeting. “I’m looking forward to the challenge because no one will give us a chance. However, they aren’t on a good run and have lost a couple recently against Port Vale and Chesterfield. “Hopefully we can catch them out as well but they are the league leaders for a good reason. “They are a very good side and I fancy them to go up this season. Morecambe will travel with a fully-fit squad provided Callum Lang recovers from an injury sustained against Stevenage last weekend. The Wigan Athletic loanee suffered ankle ligament damage early on and had to be replaced at half-time. It was a frustrating afternoon for the Shrimps, who looked set to go eight points clear of the bottom two. However, Stevenage’s late equaliser cut that possible advantage to only six. “You look at the table and those extra points would have put us right up there,” Bentley said.